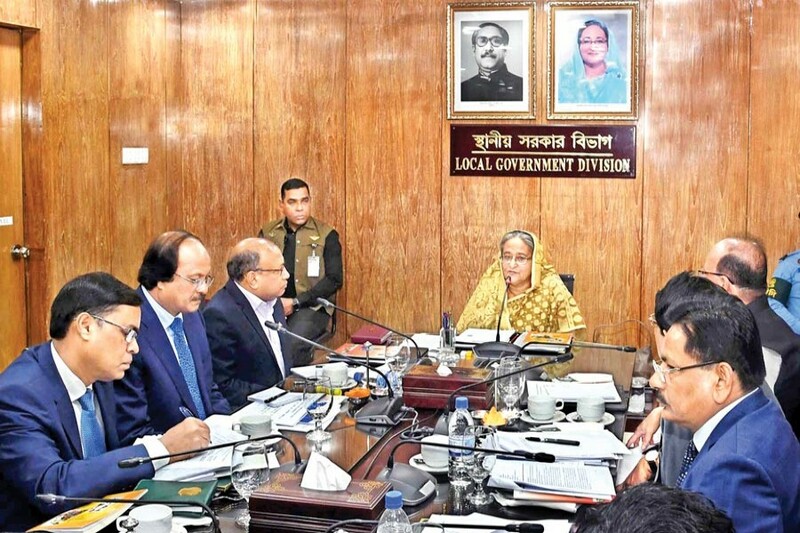 Prime Minister Sheikh Hasina asked on Sunday the LGRD ministry to sketch out a master plan to build up all upazila under a specific development design aimed at protecting cropland and check sporadic construction of buildings, roads and other structures, reports BSS. The master plan should have a complete layout for housings, hospitals, markets, schools, colleges, playgrounds, agricultural farms, industries and other facilities, she said, adding that people would accept the concept if "we can do this once properly". Referring to the Bangabandhu's initiative to constitute 60 districts, the Prime Minister said Bangabandhu made every district as an administrative unit to carry out development work, adding that "We should also do something like that to ensure development from grassroots level". Minister for LGRD and Cooperatives Md Tazul Islam gave welcome address while State Minister Swapan Bhattacharjee and Secretary SM Golam Faruk and senior officials of the ministry and Prime Minister Office were present. The Prime Minister said the government is mulling to prepare annual budget separately for every district and upazila considering its size, population and geographical aspects to meet the demands of the local people, reach the services to the doorsteps of the people and ensure optimum utilisation of public money. Pointing out the importance of the LGRD Ministry for country's development, the premier said her government wants to decentralise the administration gradually aimed at strengthening the local government bodies, engaging them in their local development initiatives and making all development sustainable. "We give highest budgetary allocation for the LGRD ministry. We will be able to alleviate poverty to a larger extent if the LGRD ministry functions properly," the Prime Minister said, adding that the country would go ahead as quick as "we can free the country from poverty". The Prime Minister said her government is taking overarching programmes for development of education, healthcare and other sectors. But there should have splan considering the basic needs of the people living in village and town areas, she said. The premier said the LGRD and Cooperatives Ministry is very important in terms of its size, activities and budgetary allocation. The tasks of the ministry are multifaceted and most important task of it is to ensure safe drinking water for the people, sanitation, development of rural roads . So, "we have to accomplish many tasks under the ministry with a very specific plan," she said. Sheikh Hasina said the 'one house, one homestead' project had been initiated so that every fallow land comes under cultivation and rural people sell their produces under a cooperative system to help them find a source of income. Sheikh Hasina said Bangabandhu Sheikh Mujibur Rahman liberated the nation.